According to this post by TechCrunch about 9.7% of traffic is driven to TechCrunch is by twitter. This makes a twitter third biggest traffic source. After reading that post, I started wondering about my own blog. In last few months I had not digged much into analytics. 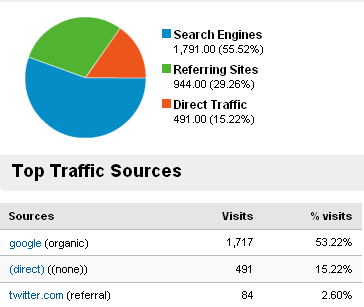 Today I logged into account to check the traffic sources to my site. Amongst just the referral sites Twitter stands first. 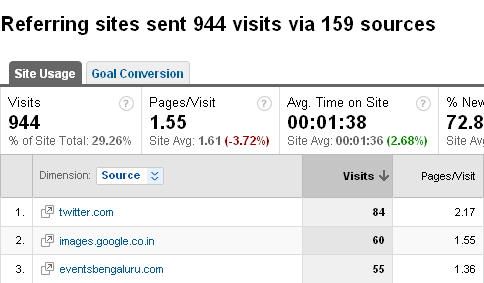 Of course the other biggest source of traffic is through feedreaders. 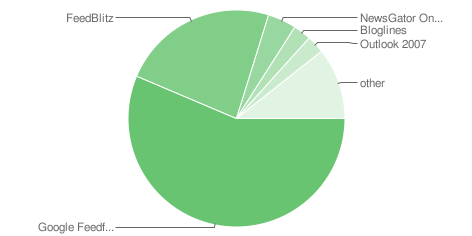 It looks like Google Reader is the most famous feed reader. Another surprising factor here is the rise of Outlook 2007 as feed reader. I have been using Outlook 2007 to read feed for some time now. I must say I am happy with it. You should use it only to subscribe to the most important blogs/newsites. For the rest continue using GReader. In all I must concentrate on twitter and outlook readers in future to get more traffic. BTW how did you arrive here? Vai Bangalore Mirror ;) http://www.bangaloremirror.com/index.aspx?page=article&sectid=1&contentid=200808252008082500454271540dde214&sectxslt= After that I am a regular visitor of this blog. I requested my friend to add my website url on their gtalk status, and one added to his status, immediately I got 10 hits for my site. So new way for pulling crowd to your website, but it is very limited compare others like you said google, twitter.